I quietly went dairy-free recently which made me a little bummed out because I love yogurt and feta and Pecorino Romano cheese. My acupuncturist was begging me for years to break up with dairy once and for all so that I might be able to stop complaining about this and that. Sure enough, without getting too personal, going dairy-free (even sheep and goat) has been a positive move for me and I am pretty motivated to keep it that way. I still give Mr. Picky raw milk and the girls eat their yogurt and cheese all the same. But when I make something for all of us to share, I’ve been using lots and lots of almond milk, like in porridges and smoothies. I haven’t gotten around to making almond milk yogurt yet, but I’d love to try. 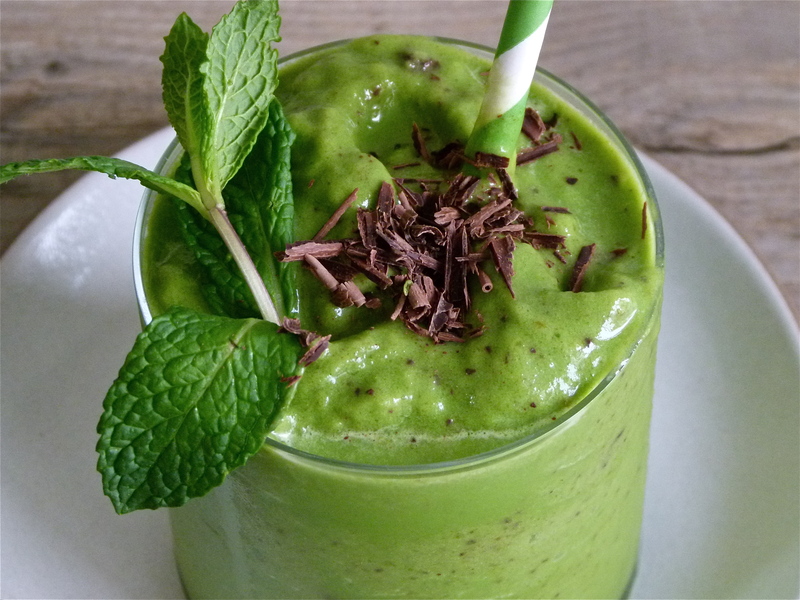 In the meantime, I just made this crazy delicious mint chip smoothie that will keep my dairy cravings at bay forever! Mint chip was always my favorite ice cream flavor and I love fresh mint in salads so how could I go wrong in a smoothie? 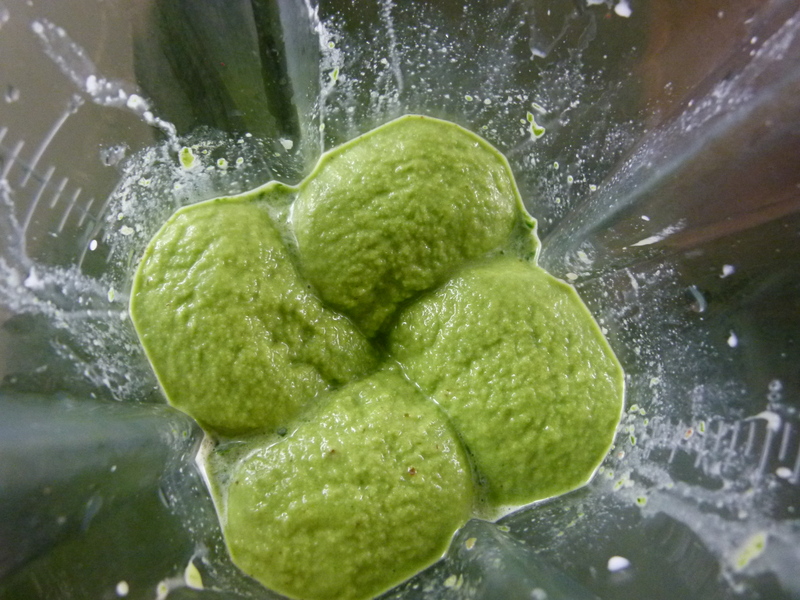 I took my Leprauchan Smoothie from last year with a few tweaks and a couple drops of peppermint extract, presto! It’s so darn good, it tastes like a dessert even though it’s totally healthful enough to eat for breakfast. Except for the chocolate chips. Who cares! It has 4 cups of spinach which you can’t even taste and a couple of dates for sweetness. Not bad at all. In fact, so stinkin’ good! My kids were even freaking out. 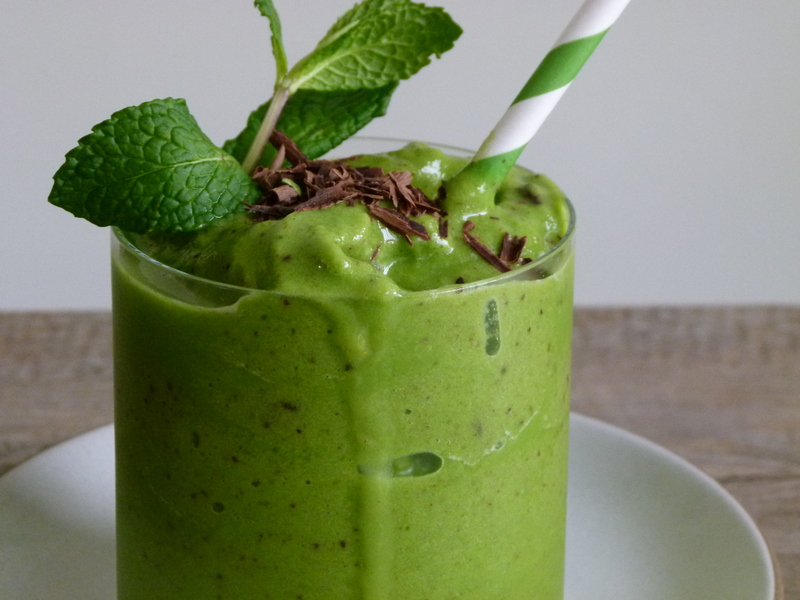 This is one of those things you’ll make for St. Patrick’s Day because it’s green and you won’t stop making it. The only thing I don’t love about it is that it’s cold. And cold first thing in the morning when the weather is still a bit chilly is a bummer for your digestive system which has to work extra hard to bring up the temperature of your stomach to where it likes to be. I try not to give the kids cold smoothies first thing in the morning on an empty stomach, and definitely not in the winter. Serving this with warm oatmeal or porridge is a better idea, or after a workout, or when the weather warms up a bit. If you have a high-powered blender, such as a Vita-Mix, place all the ingredients EXCEPT the chocolate chips into the blender and process until smooth. If you do not have a high-powered blender, the dates may not get blended completely and may leave tiny little bits of date in the smoothie. If that bothers you, blend the almond milk and dates together and then strain the mixture. Add the remaining ingredients to the blender (EXCEPT the chocolate chips) with the strained almond milk and blend until smooth. Or just use honey or maple syrup to sweeten instead of dates. Add the chocolate chips and pulse just a couple of times to break them up a bit. Divide between 2 glasses and garnish with a mint sprig and chocolate shavings, if desired. 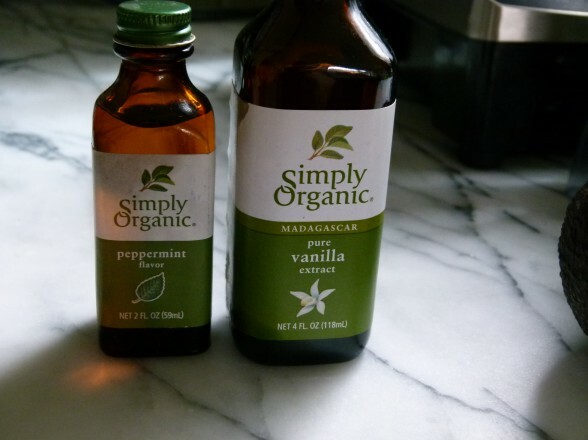 *If you want to use a sweetened vanilla almond milk or other sweetened vanilla milk, you can omit the dates and vanilla extract and sweeten to taste. I am obsessed with this smoothie. It is so delicious! I don’t like bananas, so subbed 1/2 cup of frozen mangos and it’s excellent. Sadie’s devouring it now. Alongside your green muffins which I made this morning! xo! Oooh, so nice to hear it turned out well with mango. And kudos to you for getting in all that spinach! This was delicious, everyone loved!! My favorite kind of comment to read! 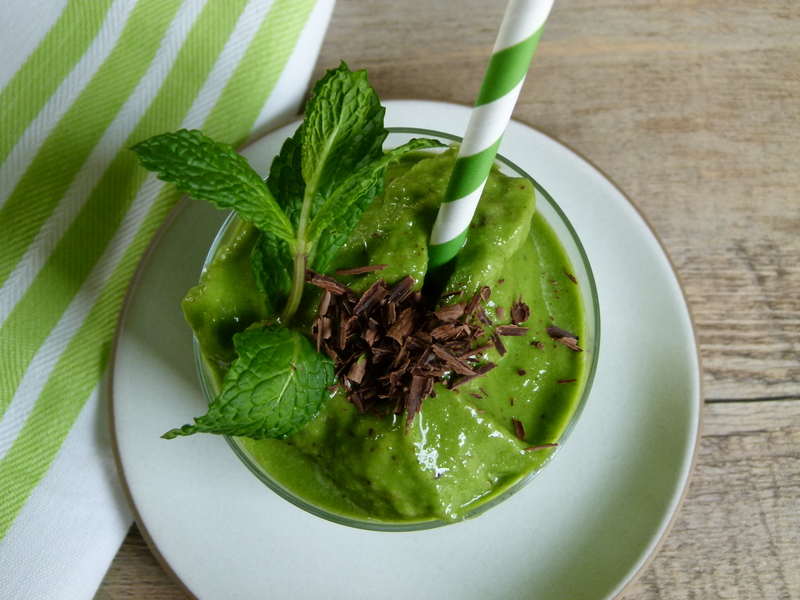 I made this smoothie on St. Patrick’s Day as our dessert. Holy moly, it was fantastic!! I love mint so I thought it was perfect. My kids both loved it as well. It was a nice treat. I actually made it the next week so I could use up my avocado. It was still yummy the second time around. Thank you again! Great idea to make this for dessert!! I like the way you think! what kind of vita mix do you use? Your smoothies look perfect. There are sooo many vita mix blenders..from 100 dollars to 400. So, I wanted to make this awesome smoothie, but I was missing several key ingredients: almond milk, cocoa nibs, peppermint! I substituted raw coconut water, unsweetened organic cocao powder,fresh mint, and a banana. Delicious! this might be the most delicious smoothie we have ever devoured… and we make smoothies every morning.. thank you SO much for sharing this recipe. That is such a huge compliment, thank you!! BTW, what an amazing blog you have. I am always on the search for chemical-free cosmetics for my daughters and me. SO excited to have found you! I’m drinking this right now. Holy hanna. It is unreal. I cannot WAIT to make it for my family for breakfast tomorrow. Thanks so much for this recipe! Awesome! Hope they enjoy it too! After hearing you talk about this in cooking class today, I finally remembered to get peppermint extract! Soooo good! I used a soft banana since it was spur of the moment and just added some more ice( not super ripe either). I will be freezing some bananas ASAP so I can make this for a treat in the future! It’s so exciting how yummy this is, right?! I think super ripe bananas are key since they add great sweetness and creaminess, but you can always add another pitted date if you need to make it sweeter. Thanks for leaving a comment! As usual, you take the most beautiful photos that inspire me to want to run (not walk) to my kitchen and pray that I have all the ingredients on hand. I had to adapt a little: I used hemp milk instead of almond milk, a few fresh mint leaves instead of the mint extract and sprinkled some raw cacao on top. Delicious & nutritious. Thank you, as always, for your elegantly easy recipes. Elise, you are too sweet, thank you. I love your adaptations — so helpful for anyone needing to make those same changes! This looks amazing! Do you think I could replace the peppermint extract with a handful of fresh mint? It is amazing!! I haven’t tried this with fresh mint, although I have made fresh mint ice cream by warming the cream and fresh mint leaves and steeping them, then straining them. 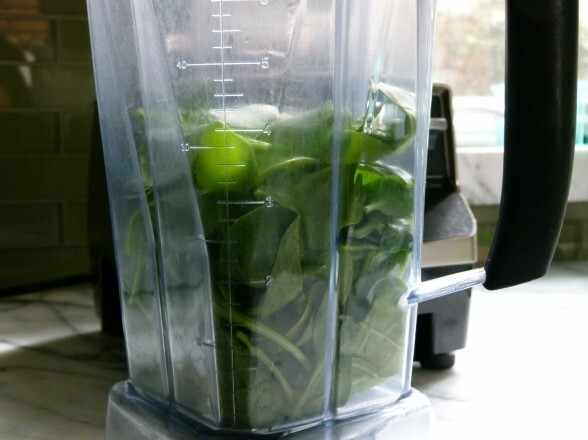 I also saw this smoothie by Dr. Frank Lipman where it says you can sub 1/4 cup fresh leaves for 1/8 teaspoon of extract. http://www.bewellbydrfranklipman.com/lifestyle/daily-living/sustain-smoothies.html#mint-chocolate-chip I would start with 1/4 cup fresh leaves and add more if necessary. I have no idea how it’s going to taste though!